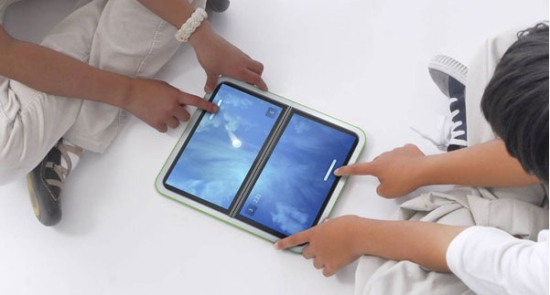 The OLPC XO-3 will include a laser ray gun! Yes, we already have a few attempts at solar paneled computers, most recently with the Samsung NC215S solar netbook, yet I don't see the smarts in including a solar panel in the XO-3 (or any other laptop). The requirement to leave the tablet out for hours in the sun mid-day to recharge is onerous, as that's when the children would want to be learning with it. Better is a separate solar recharging system that could offer power for tablets, cell phones, lights, and the whole assortment of solar powered devices now targeting the developing world. I think Negroponte has been standing in a VSAT beam too long if he thinks there is any way a transceiver strong enough to reach satellites could be housed in a tablet - and then be used close to the body. First, there is the power issue - antennas that can reach satellites would blow right through the power envelope of a tablet battery, or even a standard laptop battery. Even BGAN terminals only have an hour or two on a standard Lithium Ion battery. Then, if cell phones, which have a relative tiny radiation output, are already questionable to have near the head, there is no way children will be safe putting a satellite antenna in their laps. Radiation burns don't mix well with learning. Yet I am thinking that Amazon or Apple might be a bit more interested and interesting a partner to Pixel Qi if this technology comes into being at full production scale. Do recall that Nicholas Negroponte announced the XO-3 back in 2009, and last year said that OLPC didn't even need to make it to have impact. Well, the XO-3 better leave the vaporware realm ASAP if its gonna have any impact. The Indians have already debuted their $35 tablet, just one year after announcing it, and Apple is selling over 25 iPads a minute. We may have One Tablet Per Child long before the XO-3 ever ships.